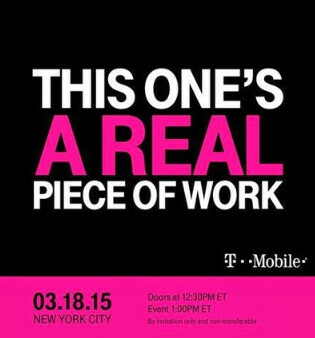 T-Mobile to hold March 18th Un-carrier event in New York City; what will Un-carrier 9.0 be? T-Mobile has sent out an invitation to promote a March 18th event it is holding in New York City. We would imagine that this is going to be another Un-carrier moment for the mobile operator. The only hint that we have is the tag line that "This One's A Real Piece of Work." This could be a hint that we will hear about something enterprise related, although truthfully it could be anything. The event starts at 1pm EDT a week from this coming Wednesday. T-Mobile continues to be the innovative tail that wags the dog, so it should be interesting to see what John Legere and crew have up their sleeves this time. Un-carrier 8.0 was announced in December and turned out to be Data Stash. This allows T-Mobile customers on a 3GB or higher Simple Choice Plan for smartphones, or 1GB or higher tablet plan, to keep the data they don't use each month for up to 12 months. To get you started, T-Mobile gives you 10GB of data to use. Once that 10GB is used up, the Data Stash program begins. So what can we expect for Un-carrier 9.0? Give us your best guesses, and keep in mind the tag line from the invitation. Keep up the pace T-Mobile!! I'd guess it has to do with data amounts for small business. It wouldn't shock me at all to see Legere announce unlimited data for small businesses under so many lines for price "x" per line per month, price "y" for per line accounts over that many lines. Not sure unlimited data for business would be much of an uncarrier initiative. Uncarrier usually fixes a customer pain point, meaning other carriers are typically doing the opposite and Sprint and Verizon still offer unlimited data for business. Besides, compared to the big 3, T-Mobile is not even a speck on the map when it comes to the business side, much less enterprise. Its business related. As a tmobile rep i can tell you that much. Do they? Sprint perhaps, but I just checked Verizons plans and they do not offer unlimited data to business customers (so far that I've checked). 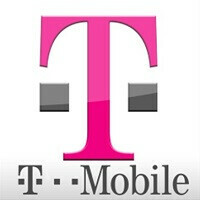 T-Mobile is starting to grow on me, Maybe after my contract with AT&T will end I will sure keep an eye on T-Mobile. Keep up the good job guys. EC, when you traveled in Europe, what speeds were you getting? Strictly 2G? Really.. !! That is good. I used to have T-Mo 3 years ago, and it was not that good. But I am sure they step their game up. I will Definitely consider it. I used to have T-Mobile back in 2008 and they have really stepped up their game since that time! They are really changing the face of the cell phone industry!